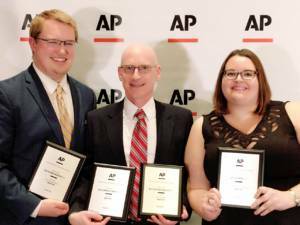 Indiana Public Radio has consistently been recognized by journalism associations for its excellence in broadcasting and news reporting. The IPR News Team has garnered awards for overall excellence, public affairs programming, election night coverage, and individual stories. These awards come from organizations like the Society of Professional Journalists, the Indiana Associated Press, Indiana Broadcasters Association, and the Radio Television Digital News Association (formerly RTNDA). 2018: Tony Sandleben, Terry Heifetz, and Stephanie Wiechmann accept station awards.